For Halloween - Fun Trendy Geometric Votive Holder or Vase Design. Can be used as a vase! put a small cup inside. Great! 2 in this order - Have them painted Black! 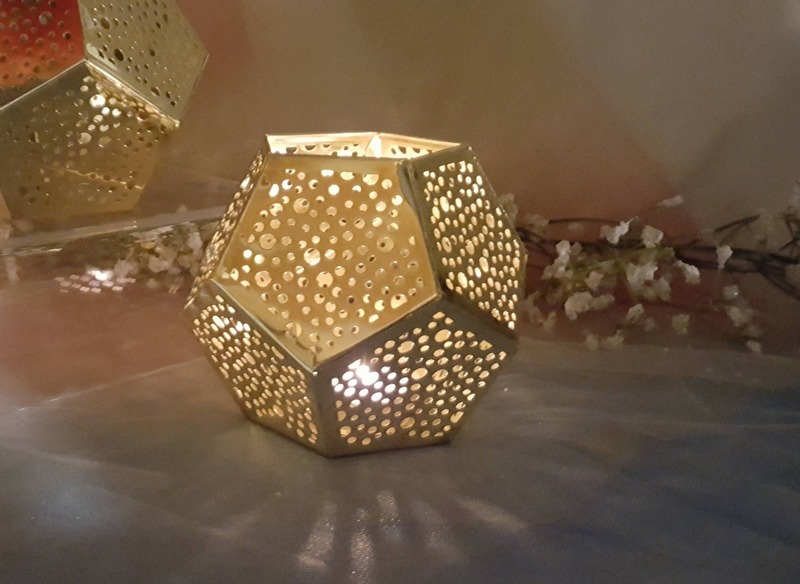 Shiny gold finish with punched-out holes, Gold Metal Punched Geometric Tea Light Holder is perfect for illuminating your surroundings. Just add the tea light of your choice! Create an ambiance of romance and sophistication at special events, parties, weddings, and more! Light just dances out of the "holes". I paint the outside / the inside is a beautiful reflective gold. These are large - I cannot wrap my hands around it. However they are very lightweight. Display candles in brilliant fashion with glamorous results. Since I sell these on different sites - Deliver times might vary. Typically 1 - 2 weeks. Shipping price is for Contiguous United States Only. Message me if you are located elsewhere. Thanks! Discount of 20 or more.